An already registered cache can be removed using the following steps. In the Cache Explorer, right click on the cache name which is to be removed. From the right click context menu select Remove. This will display a confirmation window. Click Yes to proceed with removing the registered cache. By selecting NO in the above prompt, the cache is only removed from the NCache Manager View. Remove-Cache cmdlet enables the user to remove an already registered cache and also remove cache(s) on a specified server. This command removes the cache named demoClusteredCache from the local server. 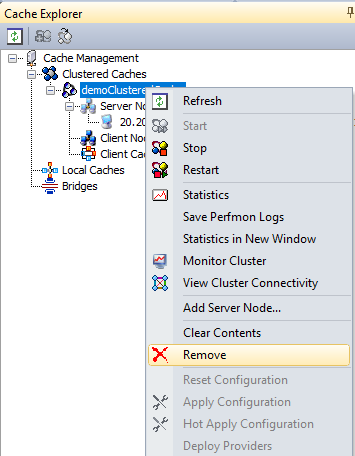 This command removes the cache named demoClusteredCache on the server node 20.200.21.11.